Update: Windows 10 cumulative update KB3213986 build 14393.693 is now available. Check out what’s new and fixed in this build. More details and changelog here. Original Story: A new Windows 10 cumulative update build 14393.693 is now under testing for Anniversary Update devices. 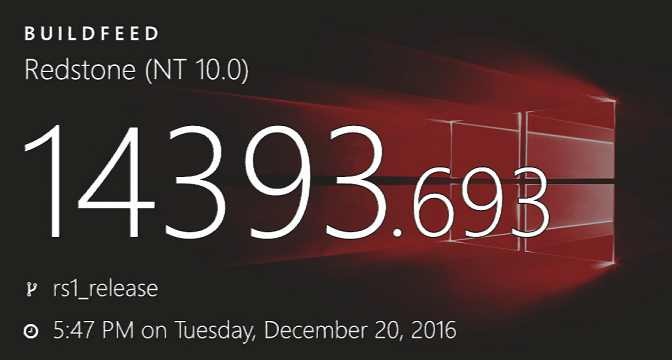 The cumulative update build 14393.693 for PC and mobile build 10.0.14393.693 were compiled on December 20, 2016. Meanwhile, Microsoft is also testing Windows 10 Creators Update build 15000 (10.0.15000.1000) internally. Recently, Windows 10 internal build 14997 (14997.1001) ISO leaked online with new features. Finally, Windows 10 build 14986 ISO is now available for download. Insiders can download official ISOs from here. Also, cumulative update KB3206309 build 14986.1001 released for Insiders members.